One of the most difficult things to do in many parts of the world if to find a single database which shows where all underground assets, utility networks such as water and waste water, power, gas, oil, and steam telecommunications including copper, fibre, and coax are located. I am aware of a few cities where this is possible. Tokyo has had a mainframe-based ROADIC system for many years. 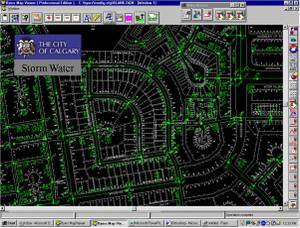 Calgary, Alberta has had the JUMP (Join Utility Mapping Project) also for many years. In Parana State in Brazil there is a joint consortium for sharing facilities and landbase data among all the utilities operating in that state, with the exception of telecommunications. Edmonton, Alberta also has a shared facilities mapping database. Sarajevo, in Bosnia, has recorded the location of all utility and telecommunications infrastructure operating in the city on paper maps for over 40 years. A few years ago Sarajevo started converting these maps to digital format. But in most places in the world, you have to go to seven or more different utility, local government, and telecommunications organizations to find where all underground facilities are located. For folks that excavate, which includes utilities, local government, and telecommunications firms, identifying the location of underground facilities is a major problem with potentially fatal consequences and is the reason for the existence of Call-before-you-dig or Dial-before-you-dig call centres that you find in most US states, all Canadian provinces, in Scotland, but strangely not in England. The ROI for the individual utilities and telecommunications firms for sharing facilities location data is large. 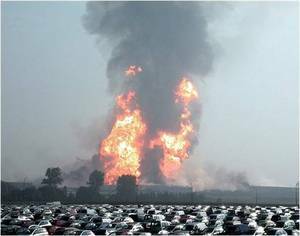 For example, a utility company with which I am familiar used to have 20 vehicles dedicated to locating underground cables. After the implementation of a shared underground facility database in the city in which they operate, they only required two which saved over half of million dollars annually. Given this background one of the talks that I really wanted to hear at AGI this year was about National Underground Assets Group (NUAG) presented by Mark Hobell of the Ordnance Survey because the UK is leading the way worldwide in creating and sharing digital underground utilities location information. One of the most important steps forward is the recent implementation of the Traffic Management Act (TMA), which requires everyone, utilities, telecommunications firms, and local government, with underground assets to exchange digital information to facilitate better street works cooperation, in other words, to avoid the problem where the water company digs up the road one week, and the power company the same stretch of road 2 weeks later. One of the problems is that the TMA does not require that asset data to be recorded based on common standards. 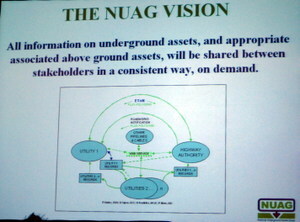 The objective of NUAG is to address this problem, to ensure a "consistent and compatible approach" to recording, storing and sharing asset, both underground and associated above ground, information. NUAG is comprised of a group of stakeholders, utilities, local government, and Mark assured the audience, telecommunications companies, to support the Department for Transport (DfT) in sharing data consistently among everyone involved with underground and above ground assets. Mark's presentation was an update on progress to date.